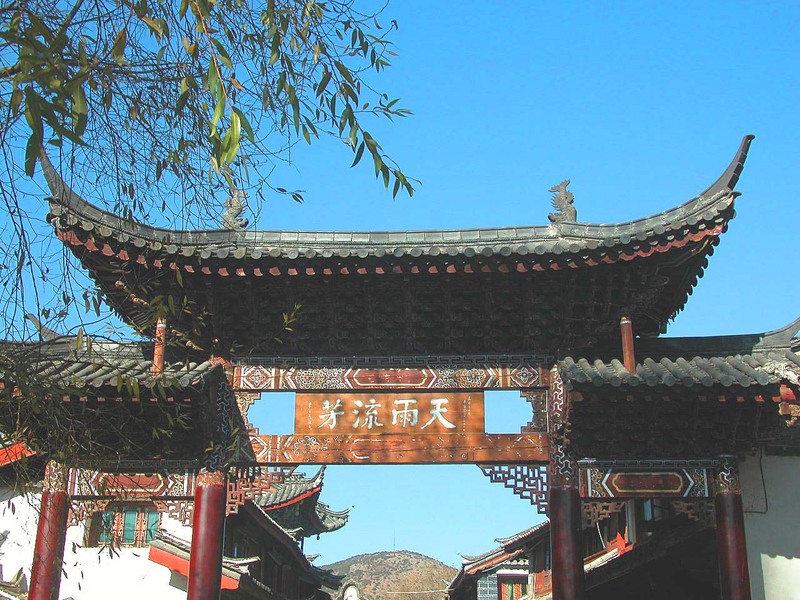 In the heart of Lijiang’s old town, before the now-famous gates of the Mu family mansion (home of the region’s ruling family during the Ming and Qing), lies an archway. Four Chinese characters are inscribed on the horizontal beam of the arch: 天雨流芳tiān yǔ liú fāng. 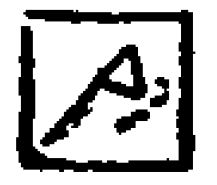 Literally, this reads ‘sky / rain / flow / fragrant (the last two characters could be read together to mean ‘leave a good reputation)’, and I have long had a vague curiosity about its actual meaning as a phrase. 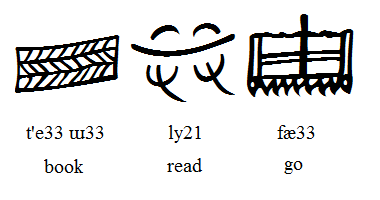 Only recently did I discover that it is a phonetic Chinese transcription of a Naxi phrase, t’e33 ɯ33 ly21 fæ33, which means ‘go and study’. Note that here the character for ‘saw’ is used as a phonetic loan for ‘go’ (imperative). The Naxi, descendants of hill tribes, believed the world to be flat. Naxi legend has it that after the nine brothers and seven sister, who were Gods, created the heavens and the earth, they erected five celestial pillars to keep the heavens from falling in. These five celestial towers, commonly perceived to be mountains propping up the sky, represent the four cardinal directions, as well as the central point, and are each associated with a certain element important to Naxi culture. 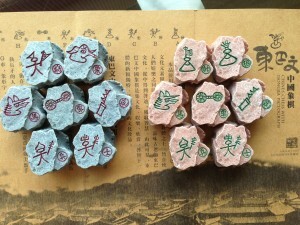 The five pillars each have a particular Naxi character associated with them – the valuable element that they represent. All these celestial pillars (or mountains) play important roles in the various legends and stories of Naxi culture, themselves incorporated into Donga religious rituals. Here’s the second part of the land contract, rendered into English from the Chinese translation by Yu Suisheng 喻遂生 in his 《纳西东巴文研究丛稿》 (vol 2). I’m sure you’ve been waiting for this with breath a-baited! 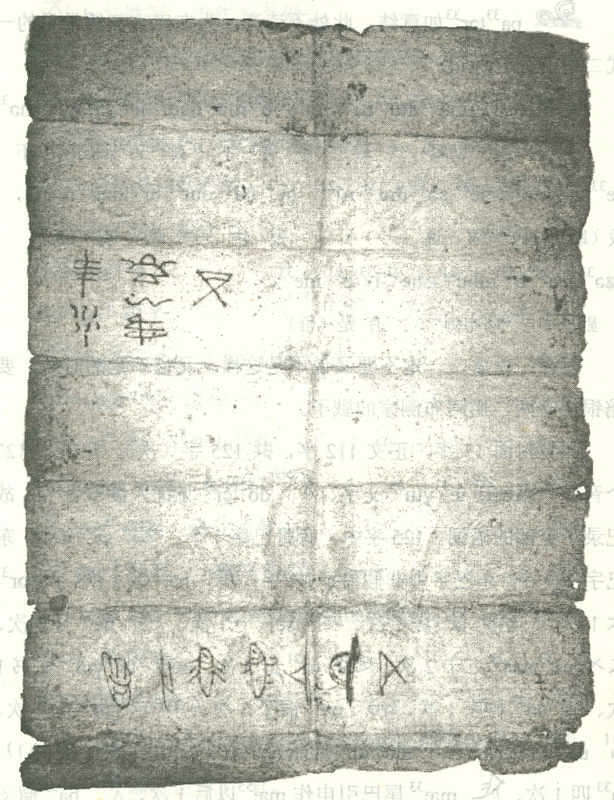 Land contracts are not the sexiest or indeed most inspiring of literary forms, and this is very bare bones as far as contracts go (I shall go out on a limb and suggest that Naxi legalese is very limited), nevertheless, it’s quite a fascinating insight into how things were done, and yes, how the Dongba script can be put to even the most mundane of uses. Sure beats tying knots in a string of old rope. 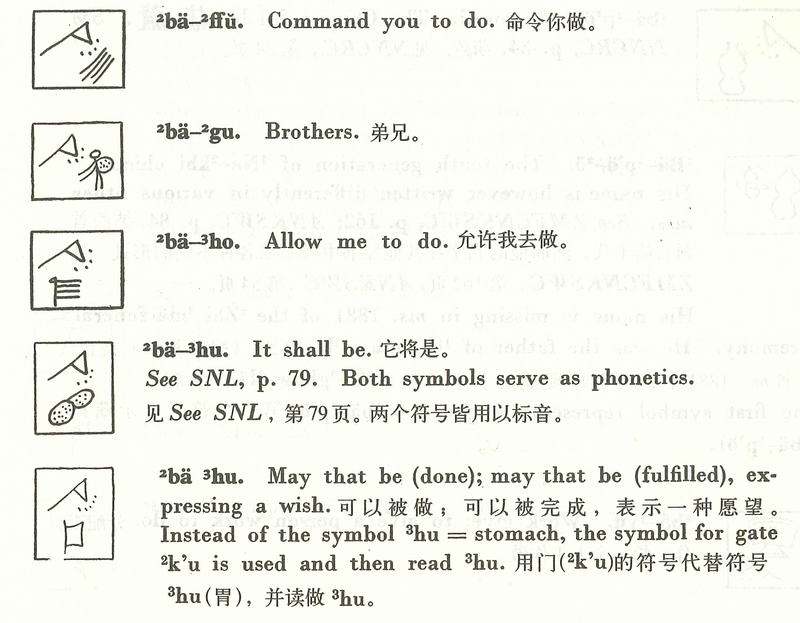 Yu Suisheng believes that the document dates to 1914 (see the first section for the explanation). How can four simple characters represent an entire nine sentences? Here’s how. 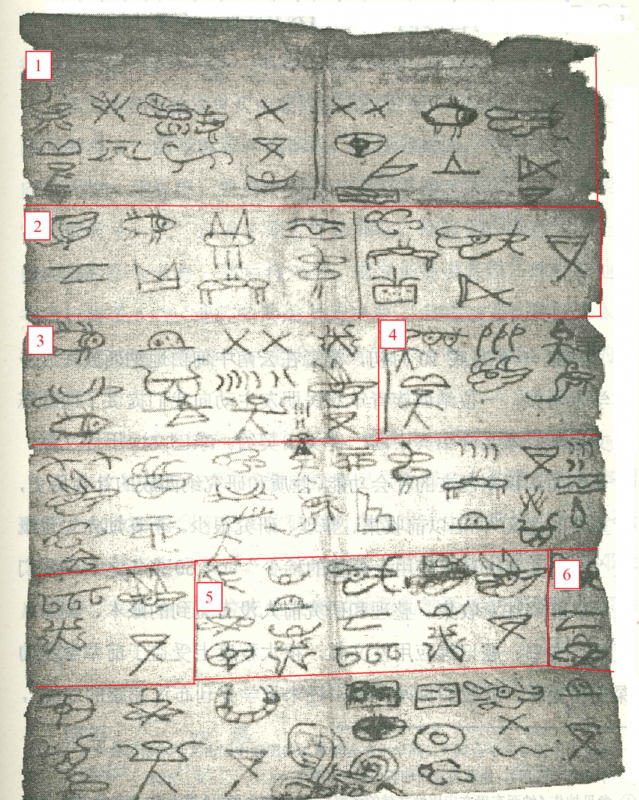 If you follow the above link you will see that I have made some long overdue updates to the ‘Reading the Script’ page, featuring an extract from a Dongba scripture, together with original script, IPA, word-for-word and fluent translations. Here’s a colour plate from 查热丽恩: 纳西族叙事诗 Chare Li’en: A narrative poem of the Naxi, as included on the page itself. Colour print from Ge Agan’s 查热丽恩, uncredited. 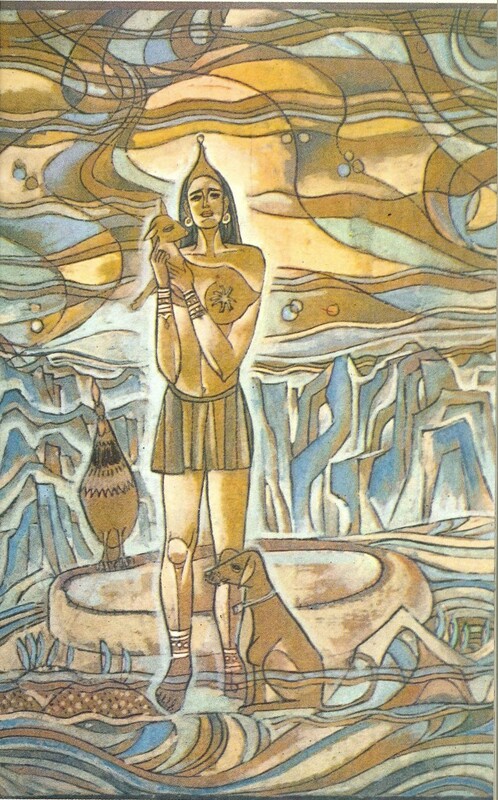 The picture shows the hero, Co Ssei Lee Ee and the three animals he saves. I will update the page with examples from other kinds of text (i.e. non-mnemonic, word-for-word texts) in due course. Nearly one full calendar year after my last post, I finally resurface with something to share. I have always liked novelty chess sets. Don’t get me wrong: I’m a horrendous chess player. I tend to get consistently out-thought by first-timers. Still, there’s something that appeals to me about chess sets. I think my first novelty chess set was probably an imitation set of Lewis chessmen that I bought on a family holiday in Scotland, but it wasn’t until recently that I discovered novelty Chinese chess sets. The game of Chinese chess doesn’t really lend itself to interesting pieces: generally speaking, the pieces are all the same size, and the same lozenge shape; and the different pieces are distinguished by written characters printed on their topside. Taobao is a wonderful thing. 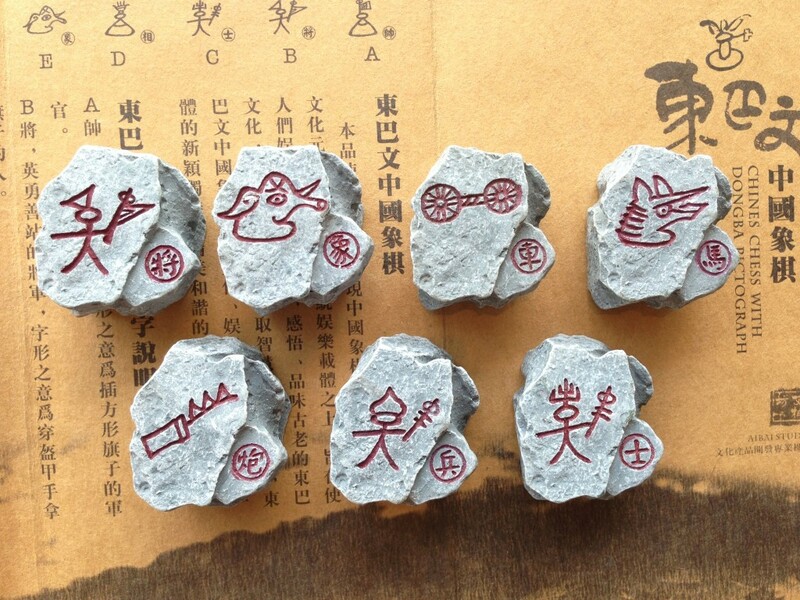 You can find nearly anything on Taobao; and ‘Chinese Chess with Dongba Pictographs’ is one such thing. This comes from a shop that also sells Oracle Bone chess sets and Bronze Script chess sets, both of which are also very cool. Anyway, it’s just a chess set; but it’s rather well presented. 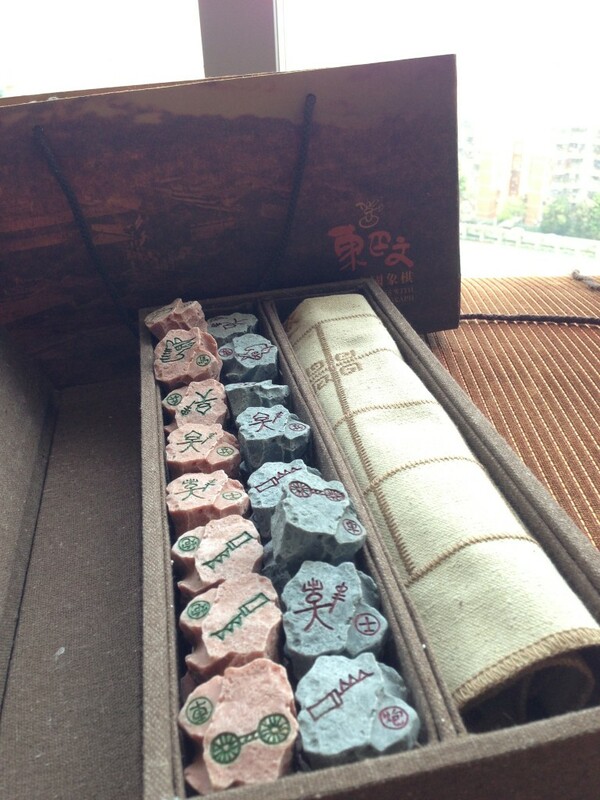 You get a leaflet explaining the pieces (even though the Chinese characters can be found in the corner of each piece) and a nice box, with a cloth map that has the Dongba character for river on it too.The pieces are ‘imitation stone’, whatever that means, and of course, the Dongba script serves to differentiate them. I’m not sure how often this will get used, but it’s a great addition to my collection of Naxi paraphernalia nevertheless. 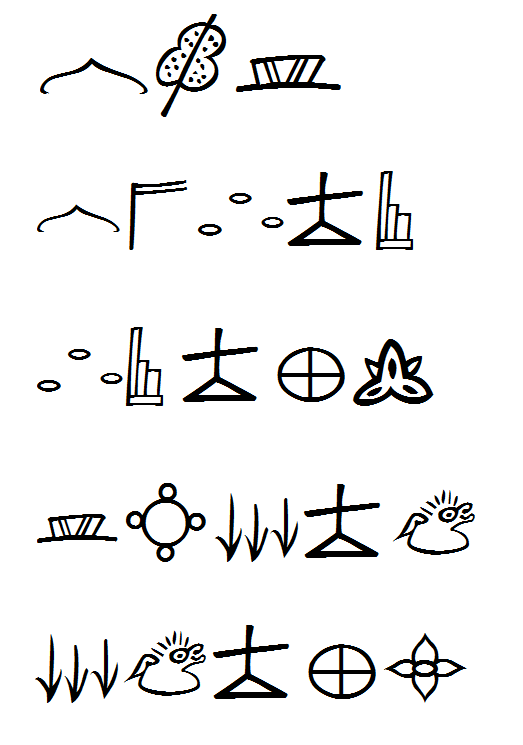 The following is a diagram used to select an auspicious date (Chinese zeri 择日) for holding a wedding ceremony – and to avoid having evil spirits bedevil the bride or groom. The picture and a gloss can be found in Wang Shiying 王世英, Naxi Dongba Zhanbu Dianji Yanjiu 纳西东巴占卜典籍研究. The Naxi believe that spirits exist everywhere around us, and that these spirits must be placated when disturbed – large events such as weddings tend to disturb the harmony between the human and spirit world. 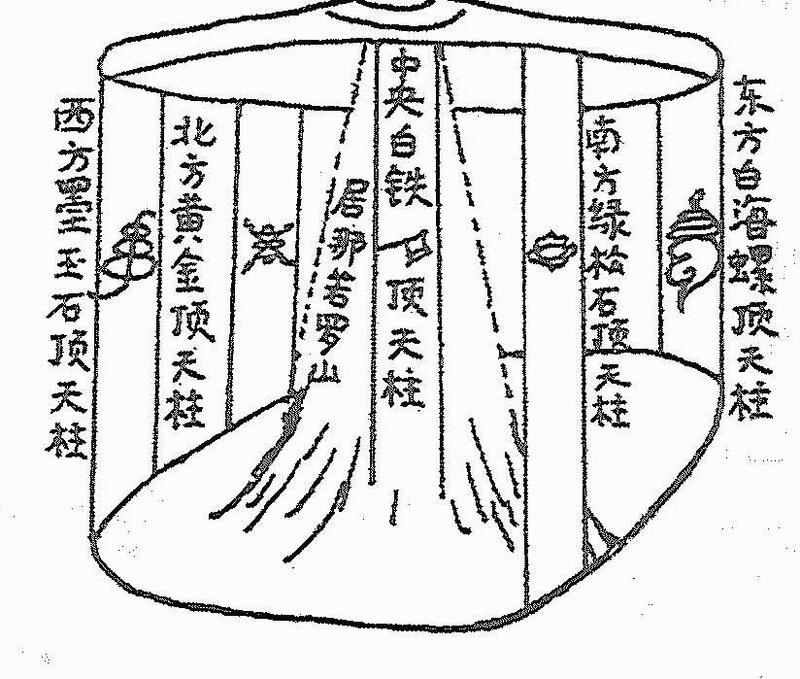 The diagram shows who, or what, will become disturbed by evil spirits depending on which day of the lunar month the wedding is held. 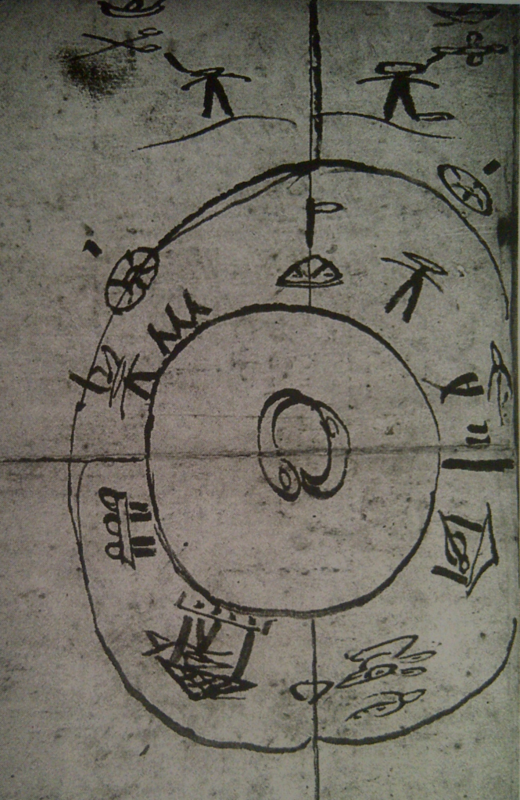 In a lunar month of 30 days ( he3 me33 dɯ21), a ‘large month’, the diagram is navigated clockwise. This is depicted by the person moving to the right in the top right corner of the chart. During a lunar month of 29 days, ( he33 me33 ʨi55), a ‘small month’, the chart is navigated counter-clockwise (the person moving to the left in the top left corner). 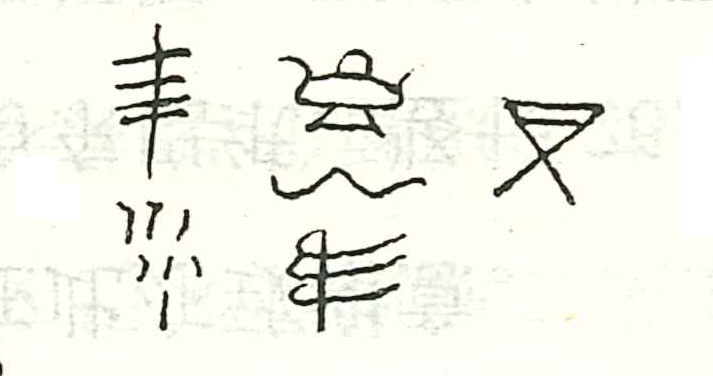 Direction of navigation is depicted by the character ʐɪ33 ʥi33, literally ‘to set off on a journey’, with the journeyer facing either left (counter-clockwise) or right (clockwise) as required. If the wedding is held on the first day of a ‘large month’, evil spirits will haunt the groom. On the second day, spirits will haunt the mothers and maternal aunts of the couple; on the third day, the new house will become haunted; on the fourth day, the paternal grandfathers and maternal uncles; on the fifth day the residence and surrounding plot will become haunted; on the sixth day the cook; on the seventh day, the bride; on the eighth day, the cook’s assistant. On the ninth day, the groom will become haunted, and the cycle starts again until the end of the month. We can see then that there are no ‘safe’ days – on every day of the month that the wedding is held, come rain or shine, spirits will end up haunting someone. I think you have to feel sorry for the cook’s assistant, who seems to be the safest bet for a haunting – he’s not a family member, nor is he presumably as important as the marital house itself. Even so, there are ceremonies that can be performed to appease the spirits that are disturbed during a wedding, so all would not have been lost for the chap who kept the stove burning.